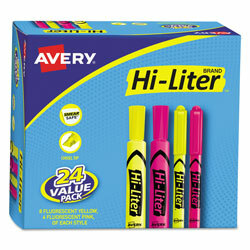 Highlighters offer vibrant read-through colors and a molded chisel tip to highlight or underline. Durable plastic tip delivers smooth highlighting, and won't fray or mush. Improved formula allows you to leave the cap off highlighter for up to one week and still highlight. Highlighters contain quick-drying, nontoxic ink. ACMI certified (conforms to ASTM D-4236). INNER PACKAGING: 24 per pack. Fluorescent Yellow, Pink Highlighters from Avery! 323 In Stock today.